When you play this card, choose up to 1 of your opponent's Battle Cards and send it to its owner's Warp. (This skill takes effect when you have 7 or more cards in your Drop Area.) 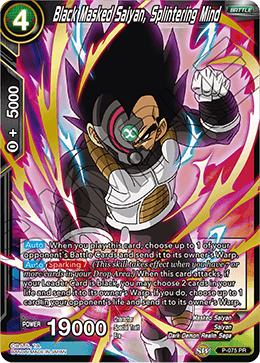 When this card attacks, if your Leader Card is black, you may choose 2 cards in your life and send it to its owner's Warp. If you do, choose up to 1 card in your opponent's life and send it to its owner's Warp.